"Vermont's most historic area" is how the citizens of Bennington describe their town. The Battle of Bennington, Grandma Moses' paintings, the grave of Robert Frost, and Bennington College	make it so. Historic, beautiful Bennington can keep you happily occupied for a day or two. If you're visiting Bennington, and you're interested in art, you should also visit the other outstanding art museums of the Museum Triangle formed by the three towns of Bennington, Vermont, and Williamstown and North Adams, Massachusetts: Clark Art Institute, Williams College Museum of Art, and the Massachusetts Museum of Contemporary Art. 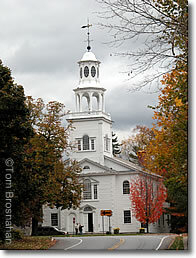 Old First Church in Old Bennington. Poet Robert Frost is buried in its graveyard.